Two classic puzzle franchises collide in a surprisingly robust, complete package. 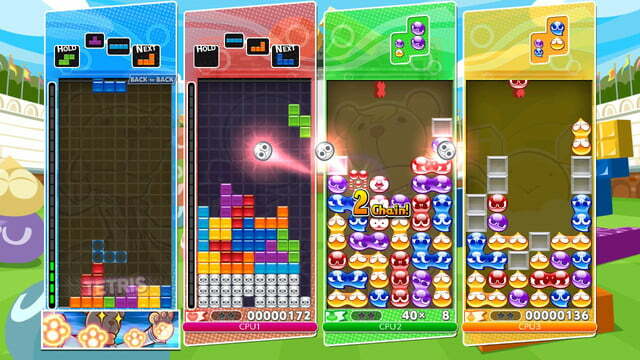 There’s nothing exactly new about Puyo Puyo Tetris. 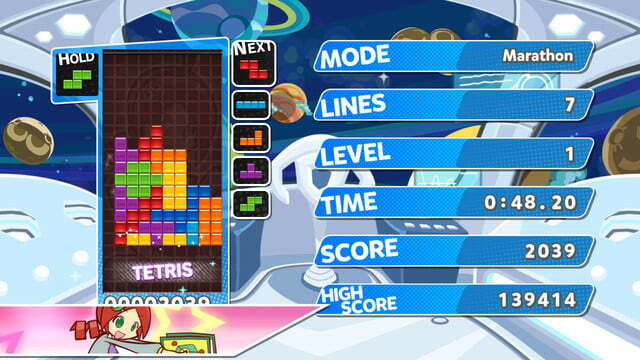 Tetris, the iconic puzzle game that needs no introduction, has been around since 1984. Puyo Puyo, the connect-four-blob puzzler formerly known as Puyo Pop, dates back to 1991. Spinoffs have shaken up both games’ formulas over the years, but their original frameworks have persisted to this day. And yet, Puyo Puyo Tetris manages to feel fresh by simply combining the two puzzle formats into one stellar package. Originally released in Japan in early 2014, the meeting of two puzzle giants has finally arrived in the states three years later. 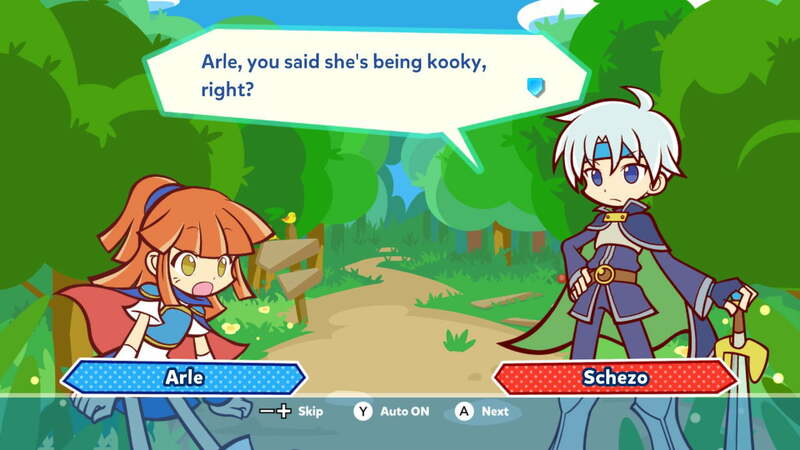 For western audiences, this is the first time in more than a decade that a new Puyo Puyo game is available. The franchise has been a mainstay in Japan since its conception, but here, for whatever reason, we had been deprived of its charming, big-eyed blob creatures. Thankfully, Puyo Puyo Tetris serves as a perfect reintroduction to Puyo Puyo by mixing and matching with our tried and true old friend, Tetris. Sure, if you prefer one over the other, you can spend all of your time playing just Tetris or Puyo Puyo — that option is here — but the game really shines when these two very different styles of play come together. 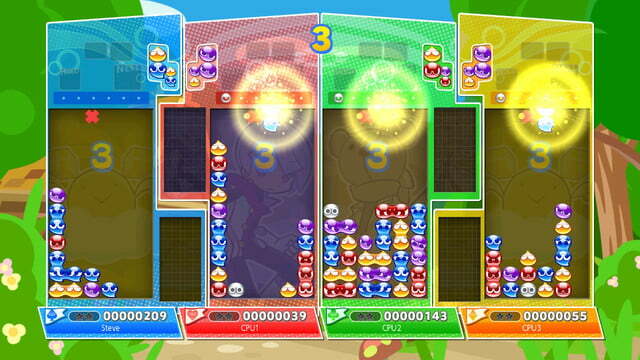 In Fusion mode, Puyo blobs and tetrominos fill the same grid. The core mechanics of each game remain the same, but the logic behind clearing them is complicated. The screen is half full with Puyo and a tetromino block is on deck, so you have a decision to make: Eliminate your gooey friends or continue to pile on in hopes of securing a nice combo. 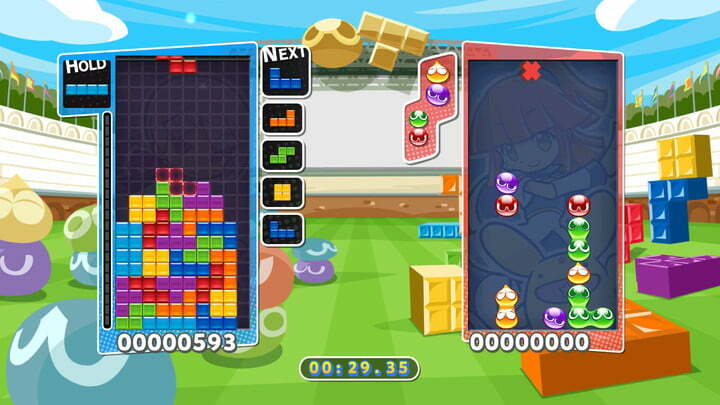 If you slam a tetromino down, the Puyo that it goes through will shoot up and land on top of it. However, if you let the tetromino descend at its normal rate, the Puyo that it passes will be churned away, clearing up space on the board. Since you are generally competing against one or more human or computer opponents, deciding which technique to use is all a matter of circumstance. There’s a certain risk/reward element in Fusion as you’re also fighting off enemy blocks that crash down on your grid and obstruct your path from connecting Puyo together. 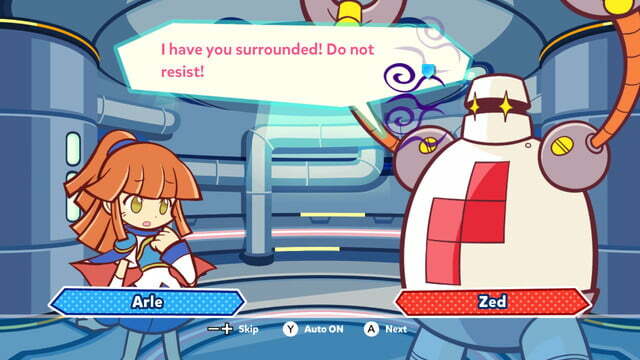 Puyo and tetrominos brushing shoulders inside one grid works better than expected, but The Sonic Team also devised another clever way to keep the games working together while maintaining their disparate identities. Swap mode switches between grids every 25 seconds. At first, this can be rather jarring, but once you learn to compartmentalize the two different rulesets, the back and forth becomes fiendishly satisfying. Even though you are technically playing two separate games, if you lose on one, you’re done. 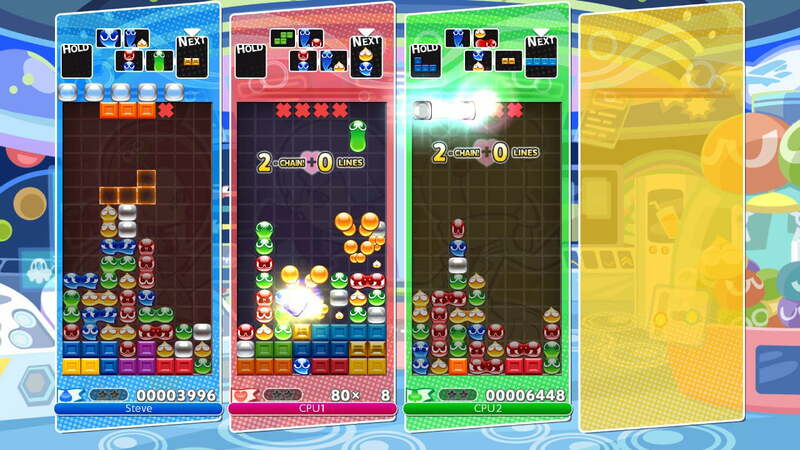 They link up indirectly as well: If you score a Puyo combo chain in the waning seconds before a swap, the blocks you send over to your opponent’s board will land in their Tetris grid, and vice versa. The premise behind the game’s adventure mode is admittedly, cliched and uninspired, but a surprising amount of the game’s plentiful (and skippable) dialogue is corny and cute enough to land. 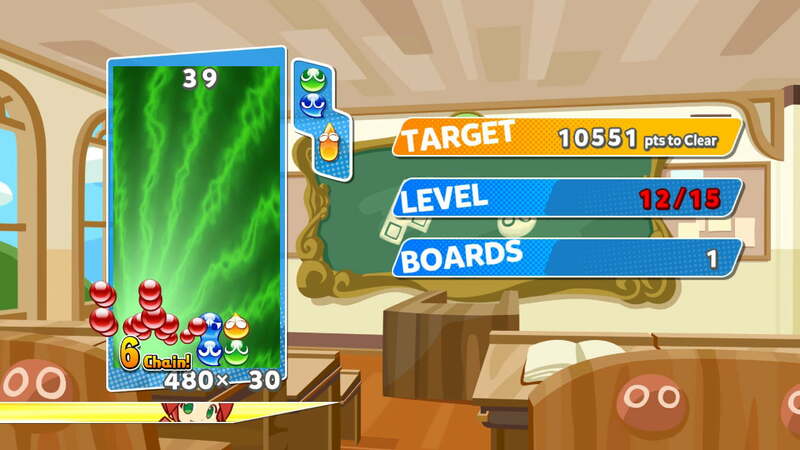 You might not think that falling block puzzles would have enough variety to retain your attention across 100 levels, but Puyo Puyo Tetris does just that. The main draw of the adventure mode is its wide array of game types and challenges. You might not think that falling block puzzles would have enough variety to retain your attention across 100 levels, but Puyo Puyo Tetris does just that. Adventure features Fusion and Swap stages, and myriad others. 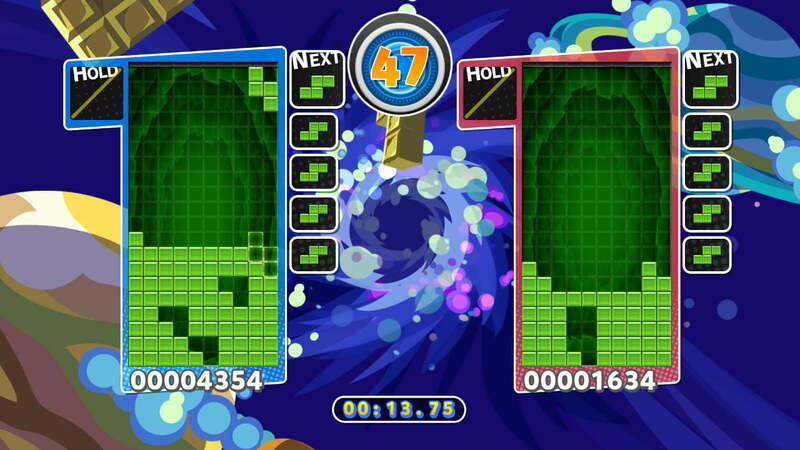 There are versus style matches where you play Puyo Puyo or Tetris against the computer. There’s a party mode which adds weapons to inflict different status elements on your opponent such as faster drop rates or larger, obtusely-shaped tetrominos. There’s the Big Bang, a mode with partially filled boards of Puyos or Tetrimos that are set up for an “all clear” combo if you place the next few pieces in the correct spots to trigger it. And there are solo trials which ask you to reach a certain score within a set time or before clearing a set amount of lines. As the stages carry on, your computer opponents become tougher — much tougher. If you manage to reach the latter stages and are not already a Tetris or Puyo Puyo aficionado, you will either have to become one or fail trying. That being said, the game does a remarkable job of scaling its difficulty, and it’s refreshing to see AI in a puzzle game that feels like it’s actually outplaying you, rather than just relying on inhumanly quick reactions. 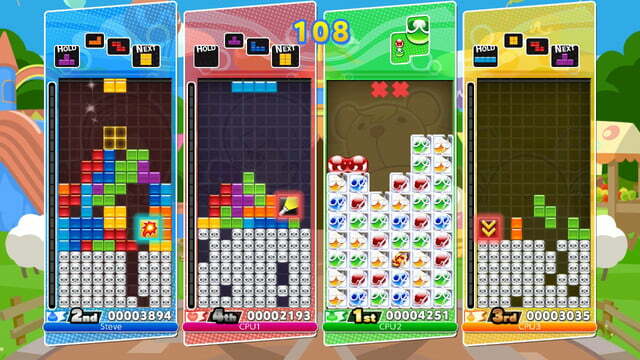 Puzzle games, especially ones in the Tetris/Puyo Puyo vein, tend to be viewed as solo experiences. Puyo Puyo Tetris supports that if you’d like, but as the Adventure mode suggests, the game shines in multiplayer, which also happens to work particularly well on the Nintendo Switch. The game features local multiplayer with single Joy-Con support, meaning that you can play it in either tabletop mode on the go, or directly on your television screen with up to four players. If your friends have a Switch, you can play over local wireless as well. The game’s online mode has lobbies for casual matches with strangers in the five main modes, or you can go through your Switch friends list. Puzzle League is the pinnacle of competitive Puyo Puyo Tetris, which pits you up against players from around the world in ranked matches. A leaderboard system tracks your progress and compares you to players both in your region and worldwide. There’s even a replay system which lets you upload your matches so that other players can watch your best moments. While we’re not saying that Puyo Puyo Tetris will become a prominent eSport, a proper and robust competitive goes a long way towards increasing the game’s staying power. Puyo Puyo Tetris doesn’t completely reinvent the puzzle genre, but its wealth of diverse content will likely keep you hooked for the long haul.